One of the perks of converting to Islam is that it puts me on the inside track to privileged information. For example, you might recall the latest death threat from Islamic State and their claim of 71 soldiers to carry out their attacks, especially against Pamela Geller. Well, wouldn’t you know it, I was just talking to a brother at Starbucks. While we were discussing how much we detested American coffee, American smartphones, American cars, American wealth, American shopping malls, bacon sandwiches, etc. “Achmed” handed me the rough draft of the latest IS threat, and asked me to proofread it. “To our brothers and sisters fighting for the Sake of Allah, we make dua for you and ask Allah to guide your bullets, provide a little marksmanship training, you guys shoot like Imperial Stormtroopers, terrify your enemies, and next time for real and establish you in the Land, but Texas!? Texas!? What in Allah’s name were you thinking!?. As our noble brother in the Phillipines said in his bayah, "This is the Golden Era, everyone who believes... is running for Shaheed" Last we heard, he was still alive. 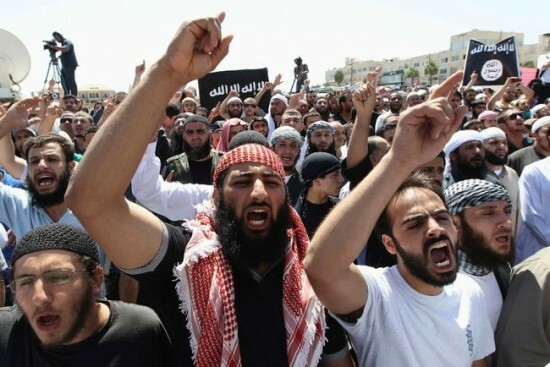 The attack by the Islamic State in America is only the beginning of our efforts to establish a wiliyah in the heart of our enemy not that we got off to a really great start, just sayin’. Our aim was the khanzeer Pamela Geller and to show her that we don't care what land she hides in or what sky shields her; we will send all our Lions to achieve her slaughter and maybe next time they’ll at least make it out of the freakin’ car!. This will heal the hearts of our brothers well, maybe not the dead ones and disperse the ones behind her. To those who protect her: this will be your only warning of housing this woman and her circus show. Everyone who houses her events, gives her a platform to spill her filth are legitimate targets but for crying out loud, you shot back! Why can’t you be more like France?. We have been watching closely who was present at this event and the shooter of our brothers (not sure if that settles the AR/AK debate). We knew that the target was protected after the fact – dangit!. Our intention was to show how easy we give our lives for the Sake of Allah skeered yet?. We have 73 71 trained soldiers in 15 different states ready at our word to attack any target we desire. Out of the 71 trained soldiers 23 have signed up for missions like Sunday, so we should be down to 48 soon. We are increasing in number bithnillah. Of the 15 states, 5 we will name... Virginia, Maryland, Illinois, California, and Michigan states where we will hold Million Muslims for Gun Control marches. The disbelievers who shot our brothers think that you killed someone untrained okay, we’ll concede that one, nay, they gave you their bodies in plain view because we were watching. To an infidel, that sounds really stupid, but it makes total sense to us. The next six months will be interesting, since we don’t really know who’s going to shoot back. To our Amir Al Mu'mineen make dua for us and continue your reign, May Allah enoble your face unless some Southerner perforates it first. There's a dog park just down the street for that. I know that Islam has had trouble making inroads into Japan - it is, practically speaking, banned - however, apparently, I'm not fully understanding the precepts of Islam. I thought alcohol was proscribed. However, if Allah has his own brand of sake, I believe we could add a little more to the punch. And if the soldiers of Allah are willing to fight for it, it must be good stuff! I imagine it would blow your socks off!!! It may be a relief from the drudgery of beet vodka. The sloppy penmanship in the picture above shows exactly what happens when one adds too much "Sake of Allah" to the punch. Great research, Kapitan Kangaroo Kourt! Imagine what would've happened if the Koran hadn't explicitly prohibited drinking alcohol beverages. The entire jihad would have gone to the dogs. This applies most especially to the knuckle dragging hayseed hick’s mythical, manufactured “right to bear arms”. Not only does this ownership of weaponry imply that the simpleton masses have the intelligence to take decisions without the assistance of benevolent progressives and that there can be ownership of anything outside of the collective but it denies the total control that Liberal Marxist Progressive policy requires to bring about the fundamental change. Blessings upon the editorial board. Komrade Kapitan Kangaroo Kourt Marshall, it's not that much of an issue. We all make exceptions for the Greater Good™. Ikaruga (斑鳩 Ikaruga?, lit. Japanese Grosbeak) is a 2001 shoot 'em up video game developed and published by Treasure. The game was released in the arcades in 2001 on the Sega NAOMI, subsequently released on the Dreamcast in Japan and then worldwide on the GameCube, and was released on Xbox Live Arcade on April 9, 2008. I thought it said "Shut up or we will shoot this piece of paper!" This Current Truth has gloriously advanced it unstoppable movement all the way to the Mother Page! Led Zeppelin has made a puny attempt at stealing this new glorious artwork for their album cover by backdating it to 2007, but the Current Truth will prevail. (Specifically, the design was made by none other than Shepard Fairey, the author of the Obama "Hope" poster). In the words of their fellow countryman Orwell, "He who controls the past controls the future. He who controls the present controls the past." So there. The above is not the first attempt by decadent Western imperialist rock 'n' roll bandits to steal the People's Cube art for their albums by backdating them with their "time stamp" trickery. Here's one "earlier" example, stolen in 1973 by the reactionary rock 'n' roll faction, commonly known by the name of "Pink Floyd." Imagine what would've happened if the Koran hadn't explicitly prohibited drinking alcohol beverages. The entire jihad would have gone to the dogs. I'm not so sure, comrade Red Square. History is replete with stories of rampaging drunkards. The mighty Roman Emperor Hadrian was compelled to build a wall, across the northern frontier in Great Britain, to keep a bunch of Scotsmen, drunk on whiskey, wearing plaid skirts and playing an instrument that sounded like cats being strangled, from marauding through the Imperial provinces. If the Jihadis are prepared to detonate themselves without being drunk, what they might do if they were drunk does not bear contemplation. OOH! AHH! WOW! OH-MY-LENIN! Comrade Red, I wanna try art! It looks like a lot of fun, and another way to help the Kollektive progress and recruit the unwashed! Comrade, great Art™ has something to say. It's more than merely an expression of one's inner proletariat. It's a celebration of the collective, as a whole. As the great Artist™ Andy Warhol showed us all, if you repeat that picture 1000 times, then you're really saying something. Then, comrade, you will be a great Artist™ and your Art™ will be held up as an example of Post-Modern Existential Pre-pubescent Inclusionary Cubist Modernity Art™ and displayed in the MOMA. You have work to do, comrade. Show the collective what we are all about! For you, War hero Kapitan! You have a future, Comrade Stierlitz! Comrade Stierlitz, I would only add, "fought for __________™ every. step. of. the. way." That makes it more progressive and uses rhetoric for self-evident proof. Works every time. "fought for the Sake of Allah™ every. step. of. the. way." makes it a minority religious experience and less susceptible to any kind of dispute. For some, comrade, the Sake of Allah™ is, in many ways, a religious experience. Thank You For Your Valuable User Feedback! Comrade Michael is to be hailed as a People's Hero! He shows that both young and old can convert to the state-supported Religion of Peace™. A canar Comrade, Beet Wodka er vodka is not Drudgery. It is the work of the exploited that helps make this fine alcoholic drink. Ergo it cannot be drudgery, true making it is a drudge, Harvesting the Beets is more of a drudge and planting the dam things is one big drudge. On the other hand how's that Punch coming?